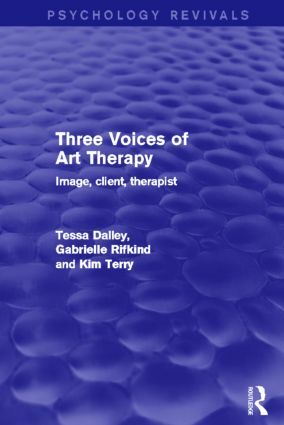 The image, the client and the therapist are three essential aspects of the art therapy relationship; each has a separate ‘voice’. In this book, originally published in 1993, the three voices come alive as the client, Kim, and the therapist, Gabrielle, tell the story of his path from suicidal despair to health and creativity through a series of extraordinary images. The images, chosen to represent the stages of Kim’s therapeutic experience, speak for themselves and convey their importance as a powerful catalyst for change. An outer voice, that of Tessa Dalley, provides a theoretical commentary on the process as it occurs, adding to the understanding of what is happening in the therapeutic encounter. This fully rounded account of clinical practice in art therapy offers a rare insight into common issues and dilemmas which will make the book of interest to both professional and non-professional readers alike.